Baked chicken wings that are perfect for your Super Bowl Sunday party. 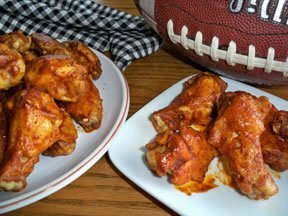 These wings will be a sure-fire hit with any of your football fans that enjoy a little heat with their wings. Don't worry though; you won't have to put any fires out! Here you will find step-by-step instructions and helpful tips on how to best prepare your ingredients for your game day chili. If you have any young football fans joining your party, this football cake will definitely catch their eyes.